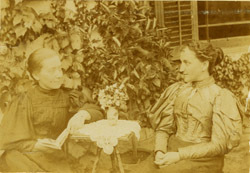 Source: Mrs. S. S. Haury? 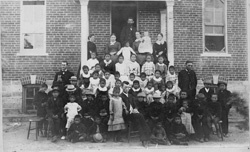 Description: west of Darlington mission school on the morning when Indian children were to leave for Halstead, Kansas, to go to school at Christian Krehbiel's; front row left to right, David? Todd, Frieda E. Voth, H. R. Voth, Mary Todd; back row left to right, ? Trempe, John Pedro, Della Haury, Mollie ? Description: Darlington Indian agency. The large building is the government school for Arapaho children. 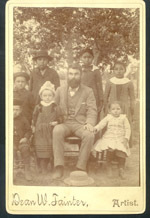 H. R. Voth in the foreground, with Indian children picking flowers. Description: Darlington mission school. Main building, wash house, barn-shed, corrals. Taken from the south. Indian children in foreground. Description: Darlington school children and teachers; "x" marks Maggie Leonard, first convert. Teachers left to right, Susie Richert (m. C. H. Wedel), Dian Luginbuehl (m. Jacob Meschberger), Maria Lehrman (m. Jacob Warkentin), Barbara Baer Voth and baby Frieda, H. R. Voth. In left hand corner, Abe Nace, J. H. Schmidt. Note: used in Richard W. Payne, The Hopi Flute Ceremony; With Observations by Reverend Heinrich R. Voth (Oklahoma City; Toubat Trails Pub. Co., 1993), p. 7, with the caption "Rev. H. R. Voth at Darlington." Description: Darlington school children and teachers; "x" marks Maggie Leonard, first convert. Teachers left to right, Susie Richert (m. C. H. Wedel), Dian Luginbuehl (m. Jacob Meschberger), Barbara Baer Voth and daughter Frieda, Maria Lehrman (m. Jacob Warkentin), H. R. Voth in doorway. Lower left standing, Abe Nace. 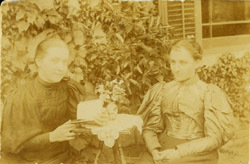 Seated center front, J. H. Schmidt. 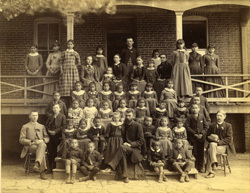 Description: Darlington school children and teachers; MLA has a version of this photo that gives names of many of the children (see 2008-0135).